Thali means platter. 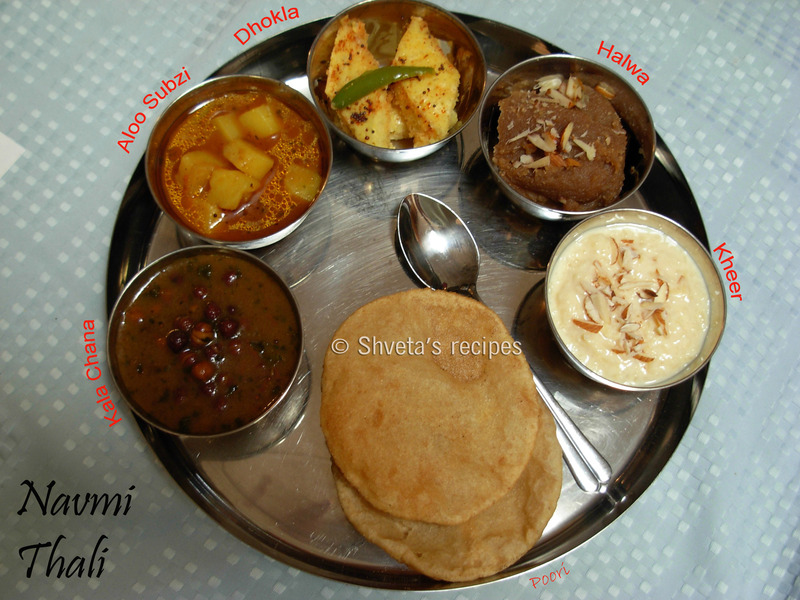 This platter is special because it has all the dishes served on festivals. This particular is for Navmi (last day of Navratra). This food is offered to Goddess and then to nine little girls. The compulsory dishes for the offering are Halwa (Pudding), Puri (Fried Indian flat bread) and Kala chana (Black gram). Rest of the menu is optional. I have already posted the recipes for Halwa(Pudding), Kala Chana, Khaman Dhokla and Shahi Kheer. Note: But for this special festival navratri menu, avoid using onions and garlic in the food. I’m so excited! I found your blog by accident. I just love Indian foods and always want to try every recipe. I will be spending my weekend on your blog! can’t wait.